Supplementary material reads: "Brown for Governor Committee. 315 W. 9 Street L.A. 15, TR 0641 Fitzpatrick. 1958-05-11. For Immediate Release. Atty. 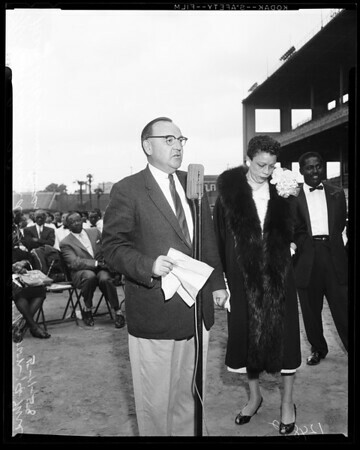 Gen. Edmund G. 'Pat' Brown yesterday paid tribute to Mrs. Mary Williams Ross (6003 Compton Ave), 'Mother of the Year' at a Mother's Day program attended by thousands at Wrigley Field. Recipient of the honor, Mrs. Ross, has lived in California for 11 years having come here from Shreveport, Louisiana, her birthplace. Mother of five children, two boys and three girls whose ages range from 13 to 21, Mrs. Ross also has three adopted children, two of whom are married and have families of their own and one who still lives in the Ross household. A successful business woman, Mrs. Ross finds time for much social and philanthropic activity. She is commander of Camp No. 16, Eastern Star and is an active member of Paradise Baptist Church. According to Joseph Matthews, master of ceremonies at the gathering in honor of Mrs. Ross, the 'Mother of the Year' award will be an annual event."